Two weeks to go until the start of the summer vacation – and there’s a lot of activity around the School of Arts! We have some key events coming up for students before the term officially comes to a close, at the end of next week. This Friday, 24th June, is our summer postgraduate conference, on the theme of ‘Looking at the Overlooked’. Registration is open and has been advertised to all MA and MPhil/PhD students – so, if you are a postgraduate in the department, and would like to attend, then please do register for a place: http://looking-at-the-overlooked.eventbrite.co.uk. In the morning, we have papers from Dr Carol Jacobi from Tate Britain, and Dr. Robert Mills from UCL. After lunch, we will be treated to presentations from a number of our research students, followed by a panel discussion and a reception. It promises to be a very stimulating day, including lots of fascinating discussion – and we are very grateful to the London Art History Society who are generously funding this event. I also mentioned some valuable Careers and Employability events coming up in my last blog, intended to help BA, Graduate Certificate and MA students who want to develop their careers in the Arts, or to move into that area. The first of these take place tomorrow, Tuesday 21st June – a session on careers for art historians, and transferrable skills, from 4-5.30pm, followed by a careers evening from 6pm onwards, where you’ll be able to hear from a number of professionals in the field, and ask questions. We then have a follow-up session on Tuesday 28th June, when colleagues from the Careers and Employability service will be providing useful tips on the practicalities of CVs and interviews. Do follow the links in this paragraph to reserve places at these events. And, of course, a key date for all students’ diaries, whichever programme of study you are on – the annual History of Art summer party! This will be taking place on the final day of term, Friday 1st July, 6-8pm, in room G01 in Gordon Square. We welcome contributions of drinks, and of nibbles – but most of all we’ll welcome your company as we celebrate the end of the academic year, and toast our finalists. We hope to see lots of you there! 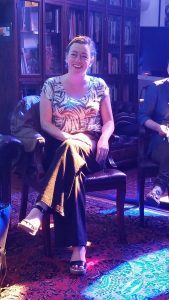 One more seminar coming up in the Murray series before the end of term – Laura Slater will be giving a paper on Wednesday 29th June (5pm, Keynes library), entitled Talking Back to Power? Art and Political Opinion in Early Fourteenth-Century England. Dr. Slater will be exploring the role of art and architecture in challenging political ideas and opinions in early fourteenth-century England, focussing on the activities of Queen Isabella of France. This promises to be a fascinating talk, considering ‘spin’ and reputation management in medieval art and politics. The History and Theory of Photography Research Centre also has one more event scheduled before the summer: a major workshop, organised in collaboration with the Birkbeck Institute for the Humanities and the Department of Law at LSE: Law and Photography: Mugshots, Passports and Portraiture (Friday 1st and Saturday 2nd July). This workshop will examine the ways in which photographic technologies have contributed – practically and symbolically – to the construction of particular legal, evidential and affective modes of vision. Papers and discussion will consider criminal mugshots, passport photographs and other forms of official and domestic styles of photographing the face in their historical and geographical contexts, and in relation to forms of gendered colonial and post-colonial identity. I want to end this blog with news of a major triumph for my colleague, Dr. Fiona Candlin, Reader in Museum Studies – indeed, all of us in the department are currently bathing in her reflected glory! 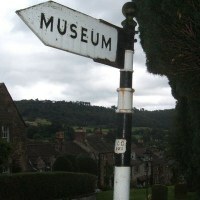 It is also a vital undertaking, as records of the approximately 1600 independent museums currently operating in the UK, and those that have opened and closed since 1960, are patchy to say the least. Currently, not enough is known about what opened, when, and where, and what these institutions’ fortunes have been. This is extraordinary gap in knowledge and understanding, as these museums – founded by community and special interest groups, or individual collectors – have revolutionised the sector in the UK. Fiona and Alex, together with their researchers, will be creating a full, searchable dataset, which will be made freely available on a project website. This material will also be used to identify patterns in the emergence, purpose, development and closure of these museums. Fiona will be looking at when exactly they opened; if there was a link between where they opened and their subject matter, or between date and subject matter; if there are areas where few museums opened or survived, and if these patterns correlate to other broader cultural or social factors. 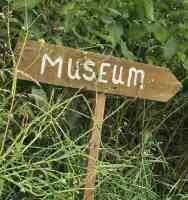 Overall, this will provide the first proper history of the UK museum boom. It’s vital work – for scholarship – for the general public – and for policy makers and arts funders looking at the sustainability and future of museums in the UK. Do have a look at the project website, for full details of this impressive project. 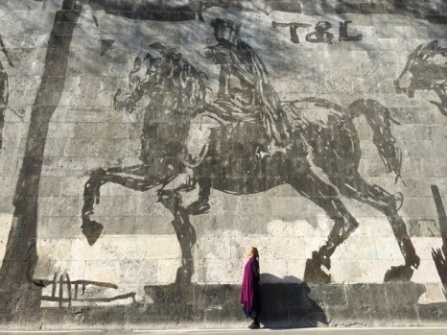 To the banks of the Tiber…. 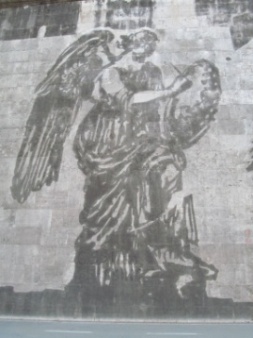 But, before I pass you on for Triumphs and Laments in Rome, I want to let you know about a great opportunity for career development, and some upcoming events. If you’re currently on our Graduate Certificate or one of our BA or MA programmes, and are thinking about how to develop your career in the Arts, or to move into this area, then I have a couple of dates for your diaries: Tuesday 21st and Tuesday 28th June. On Tuesday 21st June, 4-5.30pm, colleagues from Careers and Employability will be examining the professional routes available to history of art students, from the characteristic to the more unusual. They will also be discussing transferrable skills – where they can be drawn from, and how to use them in career development. If you would like to attend this event, please do sign up here. This session will then be followed by a careers evening organised by the department, from 6pm onwards, when a number of speakers will talk about their careers in the arts, and answer questions. There will also be drinks and nibbles – follow this link to reserve your place. Then, the following week, on Tuesday 28th June, there will be a follow up event with the Careers and Employability service, on some of the practicalities of career development. They will be talking about best practice in creating and using CVs, and about how to prepare and research for, and perform well in an interview. Here’s the link. I do strongly encourage any of you currently thinking about career development to sign up for as many of these three events as you can – they are all free, and promise to offer a wealth of useful advice and information. So, onto other events… This Thursday, 9th June, the History and Theory of Photography Research Centre hosts its next seminar (6-7.30pm, room 112, School of Arts). Luke Gartlan, from the University of St. Andrews, and editor of the History of Photography journal, will be giving a paper entitled, ‘Before “White Australia”: The Singleton Family Photo Albums and Early Australian-Japanese Relations”. My colleagues who co-organise the Architecture, Space and Society Centre meanwhile, having put on what I’m sure is a record number of events in Arts Week, are still very busy! 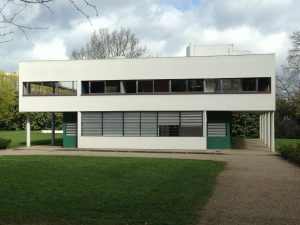 On Wednesday, 8th June, 6-7.30pm, Tim Benton will be speaking in the Birkbeck Cinema in the School of Arts on ‘Saving E-1027: Trials and tribulations in the re-presentation of Eileen Gray’s house by the sea’ . Tim Benton is Emeritus Professor of Art History at the Open University and will be asking: What are the issues in conserving a house whose unique value lies in the organisation of space through the use of furniture? 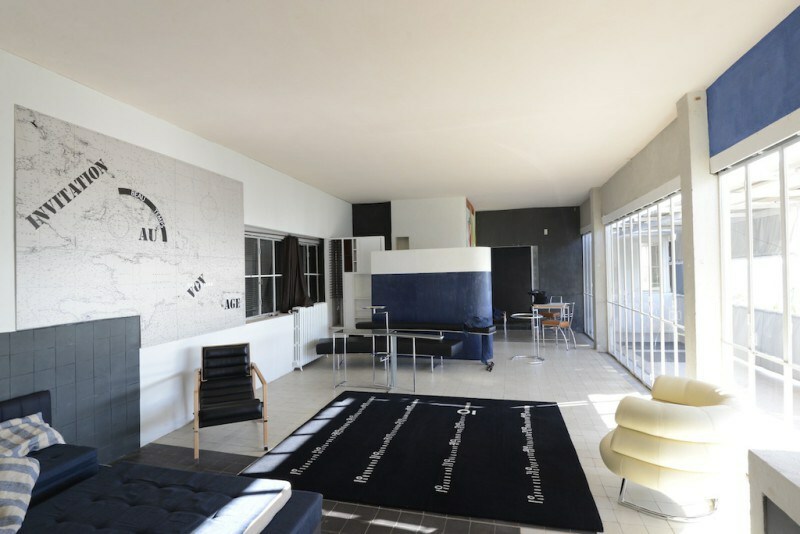 Almost all the fixed and movable pieces of furniture by Eileen Gray were sold or stolen in the 1980s. Presenting the house empty is not an option. Professor Benton will discuss the problems facing the Association Cap Moderne, which is currently in charge of the restoration, upkeep and management of the villa. Now for Katherine to take us to the banks of the Tiber…. 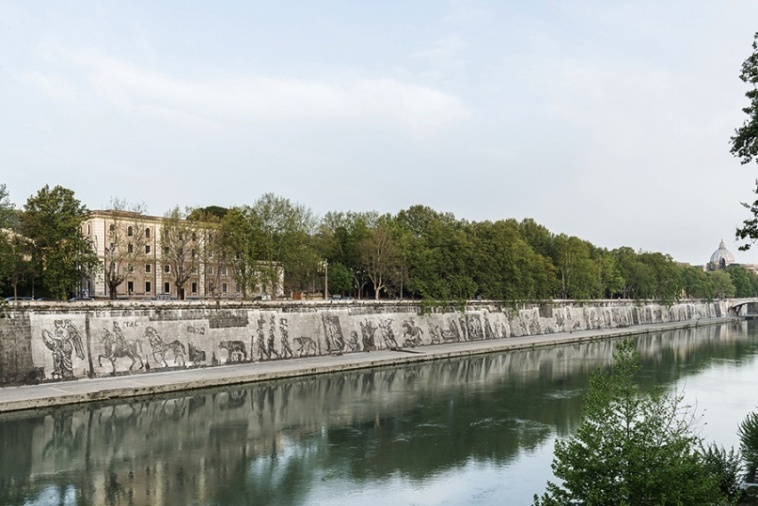 “Planning a short trip to Rome to do some research on Renaissance facade painting, I discovered that William Kentridge was in the process of executing a project on the Tiber embankment wall. As this had relevance to my research project, I emailed the organization involved, requesting an interview. The artistic director agreed and, as I am an artist familiar with a variety of media, asked if I would volunteer to work with the team on the wall. 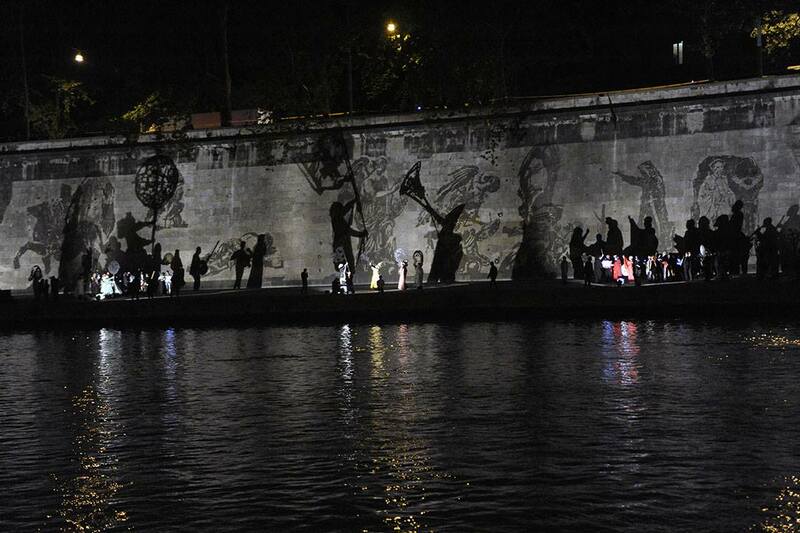 William Kentridge’s Tiber project, Triumphs and Laments, is a site specific work, 1,800 feet long and 33 feet high, executed on the only straight stretch of embankment wall of the Tiber, between the Ponte Sisto and Ponte Mazzini. The project was conceived some twenty years ago by the artist Kristin Jones, who has worked tirelessly and with great determination to bring her vision to life, despite many bureaucratic obstacles, and lack of public funding. 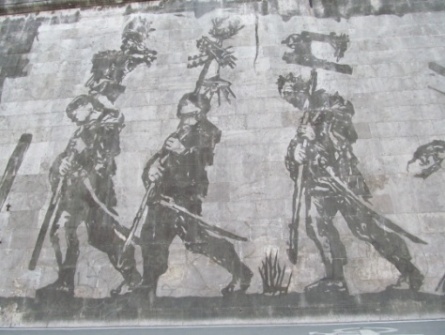 The frieze depicts eighty figures from antiquity to the present, in the form of a procession; themes of estrangement and transience compete with those of victory and ascendancy. Eighty figures from all of Rome’s history converse with each other across this vast space: Michelangelo’s Jeremiah, Anita Garibaldi, Partisans, migrants, Giordano Bruno, Bernini’s Ecstasy of St. Theresa, Aldo Moro, Marcus Aurelius, Pasolini, and scenes from La Dolce Vita, Trajan’s Column, and the Arch of Titus, to name a few. The frieze does not represent a chronological history of Rome: a team of art historians worked for three years gathering images from across the ages, from which Kentridge chose a selection, to present fragments from which the viewer can reconstruct a possible history that connects the ancient and the contemporary. The imagery was executed in “reverse graffiti”. 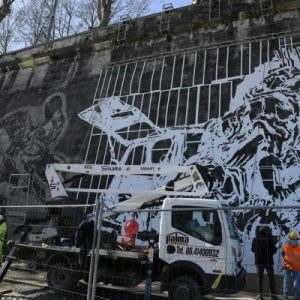 Kentridge’s small charcoal drawings were magnified, using a computer programme, and cut into huge stencils which were attached to the embankment wall. A technical crew then power washed the walls with warm water and magnesium bicarbonate, revealing the natural colour of the travertine, while the image remained in the original dirt, a combination of pollution and organic matter. The dirt that came off the walls was carefully collected, and I worked with this rather pungent “paint” to correct the details, painting over areas where the lines had been obscured, using the original plans as guidance. Walking up and down 1,800 feet all day in the blazing sun certainly gave me all the exercise I needed! 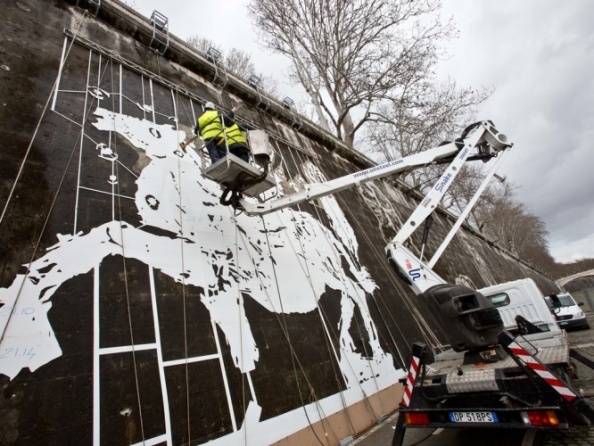 Once the wall was completed there were shadow puppets to cut out of corrugated black plastic, and costumes to make in the vast rooms of La Pelanda, Macro, Testaccio, whilst watching Kentridge rehearse processions and listening to forty musicians practising. The work was inaugurated on 21st April with an open air opera, composed by Phillip Miller and Thuthuka Sibisi, set against the backdrop of the wall frieze, which was brightly lit with spotlights. A procession from opposite ends of the frieze -one an expression of triumphs, the other of laments – everyone carrying shadow puppets which loomed large on the wall -slowly approached each other towards the centre, while a cacophony of sounds, both weird and wonderful, projected through the night air. A evening of pure magic to celebrate the 2769th mythical anniversary of the founding of Rome, in a project brought to life with the vision of Kristin Jones, the drawings of William Kentridge and a team of volunteers. I have a very special blog posting for you! 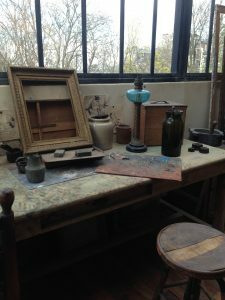 During the Easter vacation, a few weeks ago, Kasia Murawska Muthesius and Stefan Muthesius took a number of Birkbeck History of Art students, from a range of programmes, to Paris, for the annual departmental study trip. This trip takes place between the Spring and Summer terms every year, and is a wonderful opportunity to visit an important city, and study works of art and architecture in situ, in the company of a couple of experienced tutors. 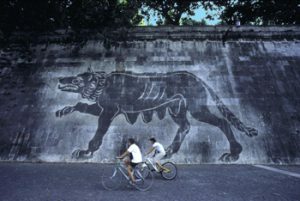 We alternate cities particularly rich in Renaissance and Modern art – and, as last year saw Joanne Anderson and Zuleika Murat’s memorable visit to Florence, it was the turn of the nineteenth and twentieth centuries in 2016…. One of the students who went on this year’s trip to Paris very kindly agreed to write a report of the visit – even though she’s only just emerged from sitting her exams! I hand you over to Kathryn Hallam-Howard, currently on the BA History of Art programme, for the rest of this posting. “A wide cross-section of students from the History of Art department participated in this year’s field trip to Paris, each with their own aspirations for the week. My own hope was that I would see Paris, a city I have visited many times, through fresh eyes. 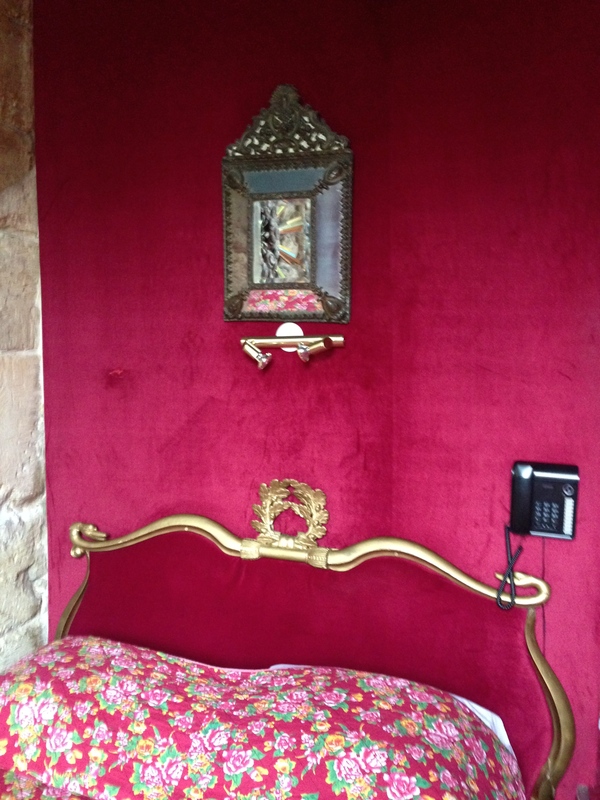 Arriving at the tackily named Hotel Esmeralda – yes, you’ve guessed it – in the shadow of the magnificent Notre Dame, I was immediately shown to a room that can only be described as a boudoir. 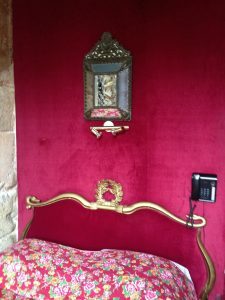 I had been warned to expect quirky, but had not quite expected to be greeted by a bed adorned with slithering golden snakes and a golden laurel wreath. No tea maker, no TV, no hairdryer – a real nineteenth-century garret to set the tone. A quick stroll through the Tuileries Gardens brought me to the imposing and massive presence of l’Èglise Madeleine, where I met up with my fellow students and our tutors, Kasia Murawska Muthesius and Stefan Muthesius. Stefan then led us around this magnificent Neo-Classical church, which embodied Napoleon’s vision to re-create an ancient classical temple to honour his army. Dodging rain showers, as we wandered through the streets of Paris, we savoured the architecture of the Place Vendôme, before a late afternoon visit to the Louvre. There we had the chance to see some great Academy paintings at close quarters. Géricault’s The Raft of the Medusa (1819-19), Delacroix’s Liberty Leading the People (1830) and David’s The Coronation of Napoleon (1807), to name but a few. Tuesday began at the Musée d’Orsay, where fellow students, David Daly, Julija Svetlova and Sheila Robinson treated us to three excellent presentations. David chose a series of five paintings by Claude Monet of La Cathédrale de Rouen (1892-4). To see these five paintings hung adjacent to each other, accompanied by David’s explanation about how Monet set about capturing the light and ambience, was very special. 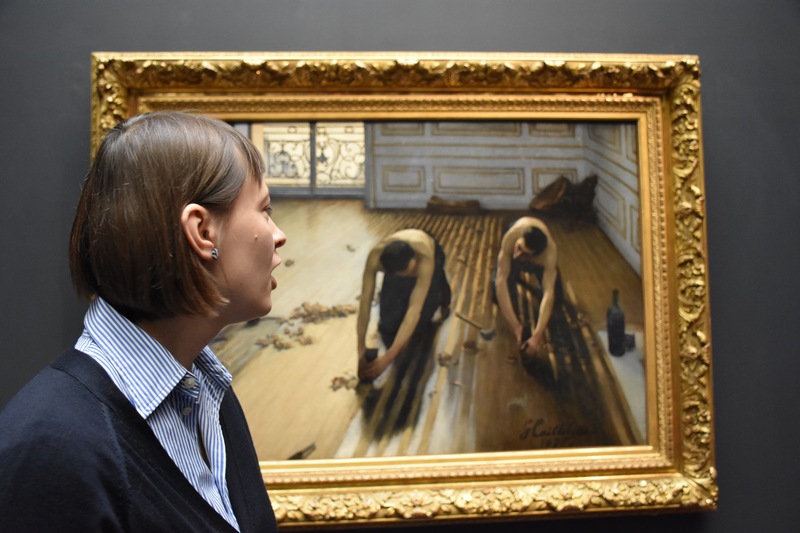 Julija introduced us to a painter unknown to most of us, Gustave Caillebotte. 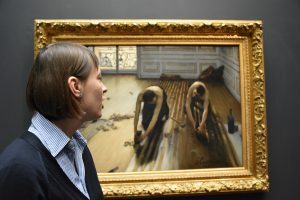 Her presentation on his atmospheric work, The Floor Scrapers (1875), revealed why her infectious enthusiasm for this artist was justified. Sheila’s choice was a beautiful and vibrant piece by Vincent van Gogh, L’église d’Auvers-sur-Oise (1890). A quick lunch at the Café des Deux Maggots, favourite haunt of Simone de Beauvoir and Jean-Paul Sartre. Pat Wadsworth entered into the spirit of the occasion and became our modern day Simone – a moment brilliantly captured by Frances Snelling. No time to linger, but onwards to the Musée Rodin. The building was formerly the Hôtel Biron and was home to several great artists. 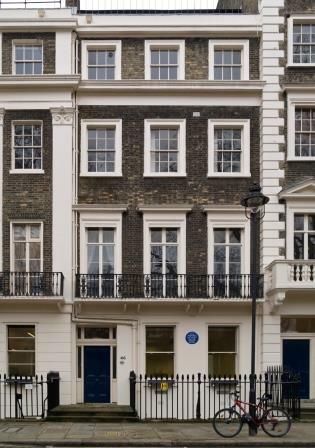 Amongst its tenants were the writer, Jean Cocteau, the artist Henri Matisse, the dancer, Isadora Duncan and the sculptress, Clara Westhoff, the future wife of Rainer Maria Rilke. From 1911 onwards, Rodin occupied the whole building and it now houses over three hundred of his works, including The Gates of Hell (1880-90), The Kiss (1882) and The Thinker (1903). It was particularly interesting to see many of his partially completed sculptures, which gave great insight into his artistic process. The day ended brilliantly with a visit to the Petit Palais, built for the 1900 Universal Exhibition. 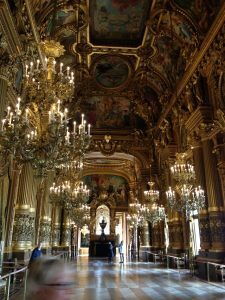 There we saw an interesting collection of works and some opulent murals, which glorified the City of Paris and celebrated the benefits of art. 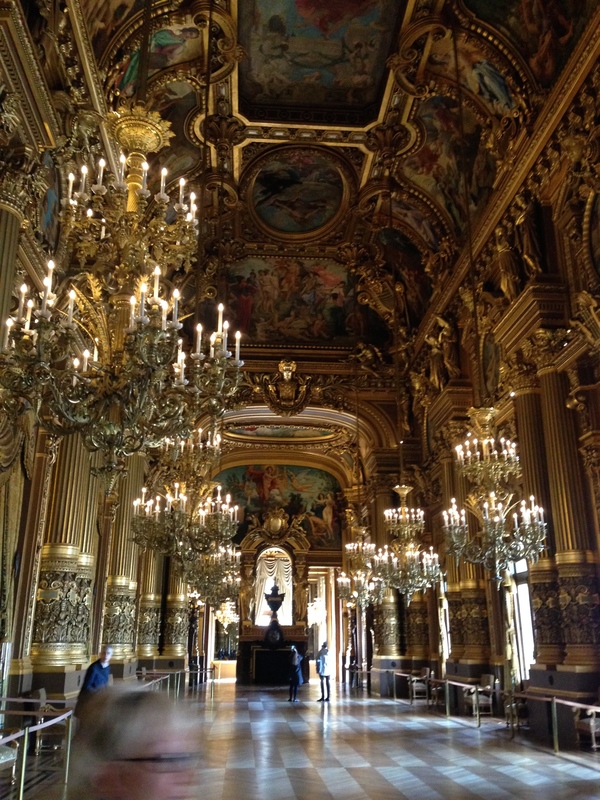 Wednesday arrived and we were off to the Opera Garnier. This beautifully ornate building is regarded as one of the most recognisable symbols of Paris. It was the setting for Gaston Leroux’s novel, The Phantom of the Opera, on which the West End musical is based. The interior is a maze of sumptuous internal spaces, leading to the Grand Staircase and the Grand Foyer, where Parisian society paraded in its finery and still does so today. A brisk walk took us through several wonderfully ornate Art Nouveau arcades to the Museé of Gustave Moreau. 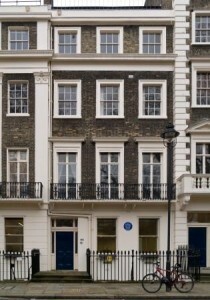 Located in his former house, it proved to be a treasure trove of his works. Moreau was a Symbolist, whose main emphasis was the illustration of biblical and mythological figures. He had a reputation for eccentricity and this was evident in his work. It is unusual to say the least. Our minds whirring with the most bizarre images, we continued onwards to savour the unique atmosphere of Montmartre. The Église Saint-Jean-de-Montmartre, which lies at the foot of the hill, was one of the first churches to be made of reinforced concrete. Its brick and tile decoration and its stained glass windows all reflect the best qualities of Art Nouveau design. A short walk up the hill and we passed a rather innocuous looking front door in a building to our left. Kasia gathered us together and informed us that the door led to the atelier where Picasso painted one of his most famous works, Les Demoiselles d’Avignon (1907). Looking at the ordinariness of the building and the narrowness of the front door, it was amazing to imagine Picasso struggling to deliver it to its first exhibition. Our next stop was certainly one of the most charming museums in Paris, the Museé Montmartre. It lies tucked away in a little side street in the oldest building in Montmartre. During its heyday, it was the home of Auguste Renoir and its peaceful gardens are named after him. Suzanne Valadon had her studio here. Valadon started life as a circus trapeze artist, but a fall led to her posing as a model for Renoir and Degas. The story goes that nine months after posing for them, she gave birth to a son. She took the boy to Renoir, who declared that the baby could not be his, “the colour was all wrong”. Degas maintained the child could not be his, “the line was all wrong”. Valadon then retired to a nearby café, where she poured out her troubles to the Spanish artist, Miguel Utrilllo. Utrillo told her to give the boy his name, since he would be proud to put his name to a work by Renoir or Degas. That baby grew up to be the artist Maurice Utrillo, famous for his many street scenes of Montmartre. 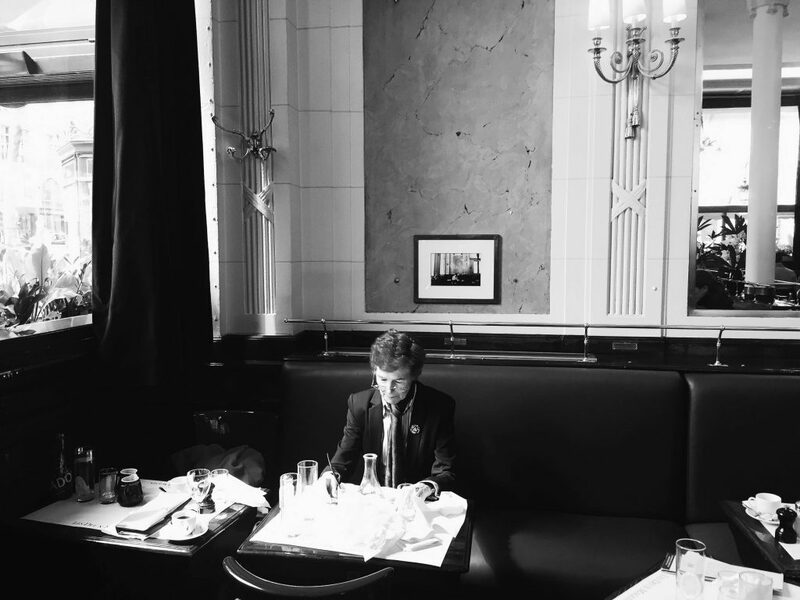 A short stroll brought us to the Café au Lapin Agile, which, under the tenancy of a local poet, Frédéric Gérard, became a magnet for artists and intellectuals. 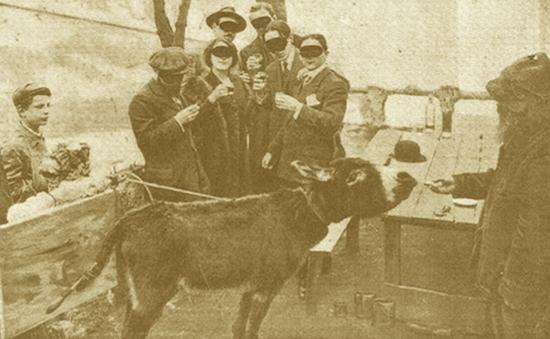 Frédé’s constant companion was a donkey, Lolo, and Lolo was the chief protagonist in an infamous art hoax, which took place in 1910. Roland Dorgelès was a writer and vociferous critic of all forms of new art. He attached a paintbrush to Lolo’s tail and held various vegetables in front of his nose, causing the little donkey to swish his tail with excitement. 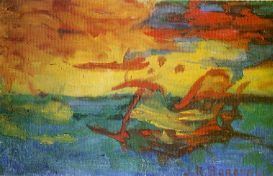 The resulting canvas, named “Sunset Over the Adriatic” by the fictitious Genoese painter Joachim Raphaël Boronali, was exhibited at the Salon des Indépendants, where it earned high praise and was eventually sold for 400 francs. This artwork was the first of the new “Excessivism Movement”, wrote Dorgelès, for a credulous Salon. The trick was then revealed amidst much hilarity and embarrassment, and Lolo’s place in history was assured. On Thursday morning, we found ourselves at the Centre Georges Pompidou, where Stefan explained the intricacies of Richard Rogers’s and Renzo Piano’s radical architecture, followed by a tour around some key paintings, led by Kasia. Sitting next to this wonderful gallery was the Atelier Brancusi. Constantin Brancusi was a Romanian sculptor, who lived and worked in Paris. Upon his death, he left his entire body of work to the French State and many items are housed in this replica of his studio, which has been faithfully re-created by Renzo Piano. 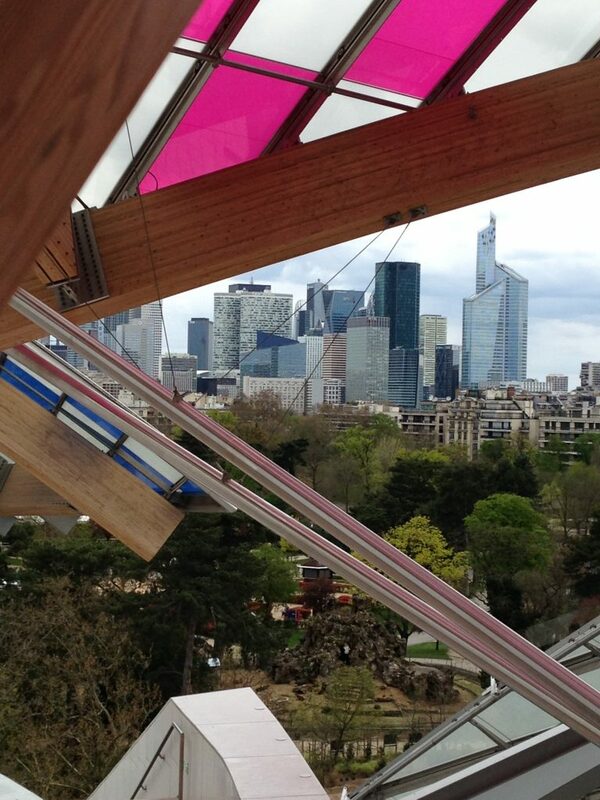 The afternoon then brought us to the extremely modern Fondation Louis Vuitton, a new private art space, housed in a building designed by Frank Gehry. Friday appeared far too soon, and our last day began at the Place du Dublin, scene of Paris Street: Rainy Day (1877) by Gustave Caillebotte. It was remarkable how little the architecture had changed. From there, we moved onwards and upwards to our final destination, Le Corbusier’s Villa Savoye at Poissy. This marvel of twentieth-century design was fascinating and a fitting place to conclude our trip.